An eager multidisciplinary work force has allowed AME to expand into civil engineering projects. 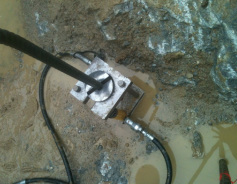 In conjunction with Geolab, AME is able to provide services for geotechnical, hydraulic, and structural based projects. Foundation design, determination of foundation bearing capacities for footer, piers, and suitability for soil construction. Soil and rock slope design, stability assessment, and reinforcement design. Design and stability analysis for coarse coal refuse embankments, fine coal slurry impoundments, hollow fills, and sediment ponds. Hydraulic investigations for urban and rural development. Storm water modeling and routing, design of sanitary sewers, sediment ponds, detention / retention basins, and diversion ditches.